It has been said that a child’s memory, subconscious mind, is heavily imprinted before the age of 7 or 8, regarding all issues, great and small. With kind words and patience, if we shift the focus from what we can teach to what they can learn, then there are many lessons to be absorbed and experienced in the formative years. Keeping eco-minimalism in the forefront, gentle wisdoms can be obtained from spending plenty of time in nature. Eco-minimalism is not about scarcity, it is about having enough of the right things – that are sustainable, practical and beautiful. Children are like sea sponges, soaking knowledge and words in, then quickly letting go of everything that does not serve them in the moment. Yet, images, associated emotions, voices and events stick all the same, and these will follow them through life. Kids are fast to say what they like, and what they don’t, they are trusting of their gut instinct. And we, parents, teachers and carers often try to correct their behavior – when sometimes we are the ones who could use a little correcting. Okay, most times it is us, carrying our own misguided epigenetic thoughts, who could use a little change of perspective. Siblings can turn out completely different from one another, even when raised with the same guidelines under one roof. We all respond to life in complex ways, without thinking about our actions. One thing is for sure though: you can trust a child to act on her emotions. When surrounded by minimalists, perhaps their own parents, or a set of adults whom they admire, life-changing events are bound to happen in a young person’s life and much if not all of this inspired by nature – what could be better, right? 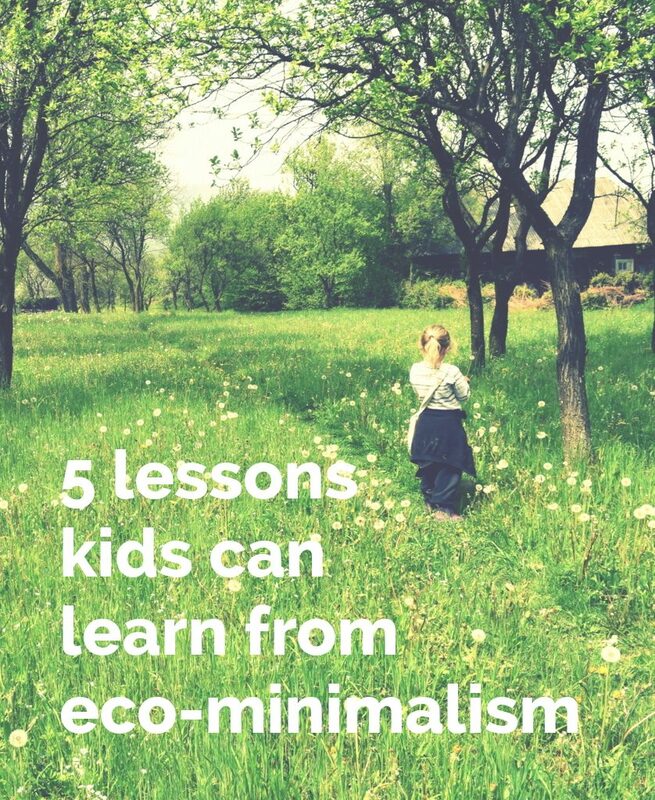 What lessons can children learn from eco-minimalism? 1| Sharing – the ability to share is innate, nature is full of examples should we choose to look under leaves and along creek banks. As babies, we offer to others what we have in our hands, ready to give an object away at a moment’s notice – though sometimes we want it back! We are learning what it means to give and to receive. As we grow older, there are times when we want our own things, but many times (especially in a society that has adopted a tendency to overconsume), we have much more than we need. In order to not waste, we must share the surplus. Looking at the world from an ecological perspective, there are plenty of resources for everybody – if we choose to share them wisely. If children see us, adults, share our excess crops, our precious time and energy, without asking for money in return, then they are likely to do the same. We don’t all need our own of everything – and we must make the distinction between wants and needs so that the message is clear, both to us and to them. 2| Caring for the environment – eco-minimalism, by its very nature, lessens the burden on the Earth as we seek to not purchase more than we need for comfortable thriving in life. It may mean going plastic-free, or striving to reduce our dependence on plastic in our homes. For example, giving up plastic drinking straws, at home and on the road. Offer a straw created naturally from a stem of tall grass, use a stainless steel one or glass instead – or simply go without! It is not a bold concept to refuse such silliness anyway, when not so long ago we drank out of wooden mugs and horns… Offer that to a child and they may reconsider the straw issue entirely. If that doesn’t do the trick, show them images of floating/sinking/polluting plastic in the seas and the devastation that a single, one-time use plastic straw causes – under 5 minutes to drink + 500 years in the environment… Again, lead by example, no straws for you either! 3| Happiness – money may bring happiness to some, but it is not the sole factor to putting a true smile on a child’s face. When you embrace an eco-minimalist mindset, you have much more time on your hands – more moments to be together, out in nature, creating memories that last an entire lifetime. Happiness is a state of mind, not a matter of the wallet. If you can smile and laugh with little, the Universe will take care of you in wonderful ways. See, nature is truly benevolent and it is ready to share its abundance with you, giving gifts of fruits, butterflies, green blades and leaves as far as the eye can see. Nature is often smiling down upon us, it is imperative that we smile back. Finding your own happiness is key to living a fulfilling life. 4| Money – to have, or not to have – or to rely on less? Money is the means to buy what we need, though it is not the only way to get what we want. Before money became the major factor of our working lives, we traded. You might spend time picking apples in summer, later to be gifted with a sled from a woodworker, because that’s what you two agreed to as a fair exchange. This requires patience and trust from both parties, yet it works. It is not instantaneous like an Amazon purchase, but trust us, it is so much more personal and rewarding. We all have skills that can be traded for things that we need, and in the future creativity may be more important than money. Start with this concept from an early age and the transition will be so much easier. 5| Success and purpose in life – an eco-minimalist life automatically allows one to discover more time and freedom in life. In return, time allows us to discover our passion – the things we are best at, what we enjoy doing and what fulfill our existence of a short time on Earth. By contrast, one who works at the same job for 45 years and dislikes the experience, retires with little energy and zest for life. This is not a positive example for a budding, creative child’s mind. Do not stuff a kid’s life with too many toys, with sports to do, with stuff they do not enjoy – leave plenty of time to relax, to daydream, and inspire them to create their own reality. While many of these thoughts may be seen as commonplace, they are not commonly followed. When most of us “go with the flow”, we are going with the flow of everyone else swimming unconsciously through life. Children who grow up in eco-minimalist households stand to learn tremendous amounts from elders who treat life with the entire ecosystem in mind. As a result, eco-minimalist kids may grow up with the intent to protect nature, as naturalists, oceanographers, foresters, and organic gardeners. Start caring from a young age and the Earth will be in good hands for generations to come. Families who practice intentional acts of sustainability together, will move this world forward, towards a greater future. Sustainability starts at home. Are you and your kids ready to be the #sustainablechange? Please tell us about your sustainable actions in the comments below! We often remind our kids that because everyone else is doing something, it doesn’t mean that’s the right thing to do. The older ones, 10 and 12 now, finally see our point and are ready to explain the reason of our actions to our younger ones. A few of our sustainable actions are: kids are drawing on the blank side of previously used paper, we use reusable napkin, handkerchief and toalett paper, and they all help growing and preparing our food. Yes, in life we have found that is is better to question, rather than to blindly follow – and to look at the overall picture. Are people happy with their lives? If not, why not? Why should we follow the wrong examples, when we could be following our own hearts? All of your sustainable actions are so wonderful and it includes your children in all aspects of life. We are so proud of you and your family, for the way you are living lighter on Earth!